A lady writer of distinction says of salutations: "It would seem that good manners were originally the expression of submission from the weaker to the stronger. In a rude state of society every salutation is to this day an act of worship. Hence the commonest acts, phrases and signs of courtesy with which we are now familiar, date from those earlier stages when the strong hand ruled and the inferior demonstrated his allegiance by studied servility. Let us take, for example, the words 'sir' and 'madam.' 'Sir' is derived from seigneur, sieur, and originally meant lord, king, ruler and, in its patriarchal sense, father. The title of sire was last borne by some of the ancient feudal families of France, who, as Selden has said, 'affected rather to be styled by the name of sire than baron, as Le Sire de Montmorenci and the like.' 'Madam' or 'madame,' corrupted by servants into 'ma'am,' and by Mrs. Gamp and her tribe into 'mum,' is in substance equivalent to 'your exalted,' or 'your highness,' madame originally meaning high-born, or stately, and being applied only to ladies of the highest rank. "To turn to our every-day forms of salutation. We take off our hats on visiting an acquaintance. We bow on being introduced to strangers. We rise when visitors enter our drawing-room. We wave our hand to our friend as he passes the window or drives away from our door. The Oriental, in like manner, leaves his shoes on the threshold when he pays a visit. The natives of the Tonga Islands kiss the soles of a chieftain's feet. The Siberian peasant grovels in the dust before a Russian noble. Each of these acts has a primary, an historical significance. The very word 'salutation,' in the first place, derived as it is from salutatio, the daily homage paid by a Roman client to his patron, suggests in itself a history of manners. "To bare the head was originally an act of submission to gods and rulers. A bow is a modified prostration. A lady's courtesy is a modified genuflection. Rising and standing are acts of homage; and when we wave our hand to a friend on the opposite side of the street, we are unconsciously imitating the Romans, who, as Selden tells us, used to stand 'somewhat off before the images of their gods, solemnly moving the right hand to the lips and casting it, as if they had cast kisses.' Again, men remove the glove when they shake hands with a lady—a custom evidently of feudal origin. The knight removed his iron gauntlet, the pressure of which would have been all too harsh for the palm of a fair chatelaine; and the custom, which began in necessity, has traveled down to us as a point of etiquette." Each nation has its own method of salutation. In Southern Africa it is the custom to rub toes. In Lapland your friend rubs his nose against yours. The Turk folds his arms upon his breast and bends his head very low. The Moors of Morocco have a somewhat startling mode of salutation. They ride at a gallop toward a stranger, as though they would unhorse him, and when close at hand suddenly check their horse and fire a pistol over the person's head. The Egyptian solicitously asks you, "How do you perspire?" and lets his hand fall to the knee. The Chinese bows low and inquires, "Have you eaten?" The Spaniard says, "God be with you, sir," or, "How do you stand?" And the Neapolitan piously remarks, "Grow in holiness." The German asks, "How goes it with you?" The Frenchman bows profoundly and inquires, "How do you carry yourself." It is said: "A bow is a note drawn at sight. You are bound to acknowledge it immediately, and to the full amount." It should be respectful, cordial, civil or familiar, according to circumstances. 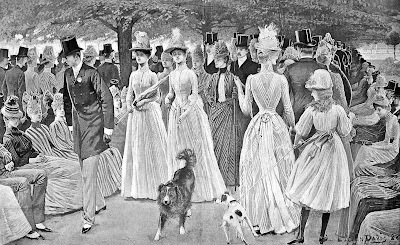 Between gentlemen, an inclination of the head, a gesture of the hand, or the mere touching of the hat is sufficient; but in bowing to a lady, the hat must be lifted from the head. If you know people slightly, you recognize them slightly; if you know them well, you bow with more familiarity. The body is not bent at all in bowing; the inclination of the head is all that is necessary. A bow should never be accompanied by a broad smile, even when you are well acquainted, and yet a high authority well says: "You should never speak to an acquaintance without a smile in your eyes." The words commonly used in saluting a person are "Good Morning," "Good Afternoon," "Good Evening," "How do you do" (sometimes contracted into "Howdy" and "How dye do,") and "How are you." The three former are most appropriate, as it seems somewhat absurd to ask after a person's health, unless you stop to receive an answer. A respectful bow should accompany the words. An authority upon this subject says: "The etiquette of handshaking is simple. A man has no right to take a lady's hand until it is offered. He has even less right to pinch or retain it. Two young ladies shake hands gently and softly. A young lady gives her hand, but does not shake a gentleman's unless she is his friend. A lady should always rise to give her hand; a gentleman, of course, never dares to do so seated. On introduction in a room, a married lady generally offers her hand; a young lady, not. 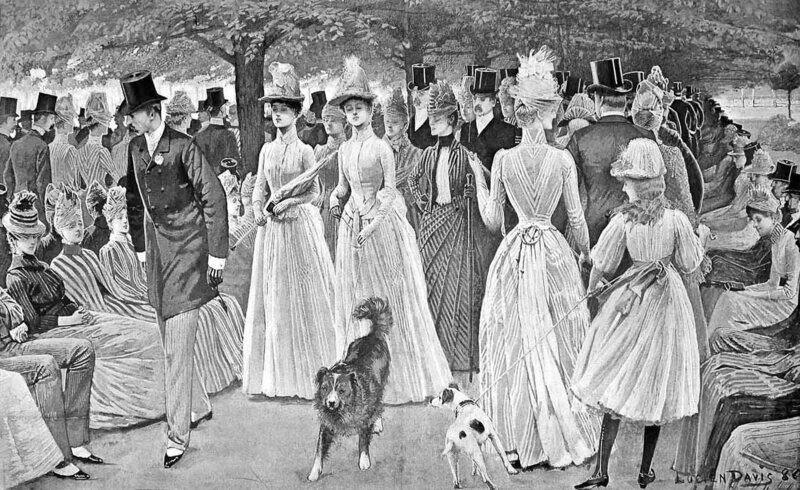 In a ball-room, where the introduction is to dancing, not to friendship, you never shake hands; and as a general rule, an introduction is not followed by shaking hands, only by a bow. It may perhaps be laid down that the more public the place of introduction, the less handshaking takes place. But if the introduction be particular, if it be accompanied by personal recommendation, such as, 'I want you to know my friend Jones,' or if Jones comes with a letter of presentation, then you give Jones your hand, and warmly, too. Lastly, it is the privilege of a superior to offer or withhold his or her hand, so that an inferior should never put his forward first." When a lady so far puts aside her reserve as to shake hands at all, she should give her hand with frankness and cordiality. There should be equal frankness and cordiality on the gentleman's part, and even more warmth, though a careful avoidance of anything like offensive familiarity or that which might be mistaken as such.